If you venture outside of Seoul during your time in Korea (as you should), Gyeongju is the place to go. Korea used to be divided into three major kingdoms (Silla, Baekje, and Goguryeo) until the Silla kingdom conquered the other kingdoms and made Gyeongju the capital. Gyeongju remained the capital of this region for approximately 1000 years, leading to the creation of a number of archaeological treasures that are well worth your time. When visiting Gyeongju, there is no better place to stay than Sarangchae. 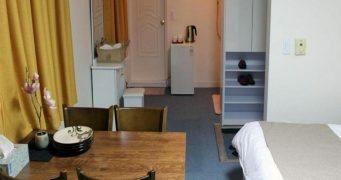 It is conveniently located a 5 minute walk from a beautiful royal tomb park and also nearby Cheomseongdae, the oldest observatory in Asia, which has impressive stonework (imagine a Coca-Cola shaped stone bottle). 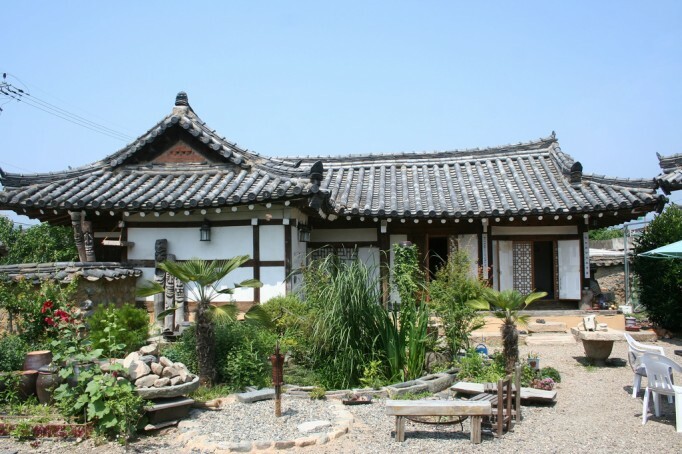 Amidst the scenery of ancient Korean kings, try your hand at sleeping on the floor of an ancient traditional Korean house just like Koreans did back in the day. Share the experience with others by listening through the paper thin walls or better yet, by meeting them in the courtyard where you can share stories over a nighttime campfire. It is no surprise that a country known for its beauty and cosmetics is also the one with a mud festival started by a local cosmetic company. The Boryeong Mud Festival was started in 1998 to promote the local therapeutic mud, this annual festival has become extremely popular among both locals and expats, drawing more than 2 million people. 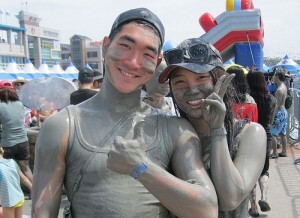 Held in Boryeong, a town on the western coast of Korea, the Boryeong Mud Festival is a great way to celebrate the summer at the beach before the monsoon season, all while enhancing the nutrients in your skin. Cover yourself in a thick, gray mud (or even colored mud, which is artificially made) as well as partake in mud wrestling pits, slides, and lots of activities throwing you back to your childhood days. There are also performances from musicians to keep you entertained while you’re there. While the festival goes on for the last two weeks of July, you probably don’t need to go for more than one or two days. Try to go for the final weekend if you can. If you have ever seen a Korean soap opera before, you know that Koreans are extremely sentimental. It is also no surprise that a pilgrimage of love to go to Seoul’s Namsan Tower gained popularity due to the actions of two television stars. In order to declare everlasting love, the couple wrote a message on a lock, attached it to the fence on Namsan Tower and threw away the key. 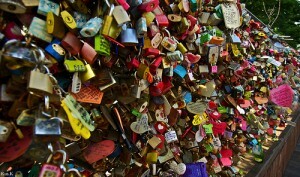 Now, you can not only see thousands and thousands of locks and love messages here, but you can also create your own. Feel free to purchase your lock or phone case ahead of time or buy them at the gift shop upon arrival. You can even see small trees that consist entirely of love locks. Try to read a few of the messages to see promises fulfilled (unfulfilled) and to remind yourself of young love. You can’t help but wonder what happened to the future of all these couples. Solidify your love or make a declaration for a future love. What better way to celebrate a visit to Seoul than by soaking in the beautiful skyline views of Seoul and also by experiencing the sentimental thoughts of love? Be sure to come close to sunset to get the full experience. Koreans not only like to go out to a lot of different spots when they go out, but they also stay out really late. After going to a bar or a club for a few hours, it’s inevitable that you get hungry. What better place to go to eat than underneath an orange, outdoor tent? 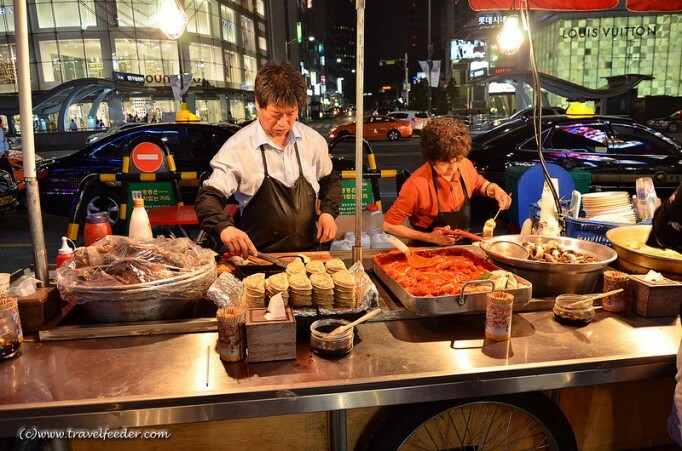 These street food tents with plastic tables and chairs are called pojangmachas (포장마차), literally meaning “covered wagon.” Here, you can feel some of the emotions of Koreans as they discuss the events of a long work or school week. 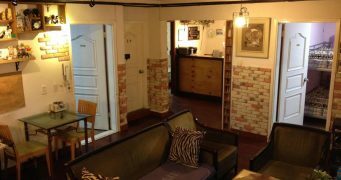 Though not a huge area, one of my favorite spots to go is on a Thursday, Friday or Saturday night in Itaewon near the subway station. 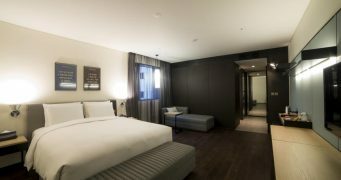 Come by after visiting some of the Itaewon bars or clubs. Even at 4 in the morning, this area is hopping. While having green onion pancakes (pajeon, 파전) , tempura (튀김), Korean style sushi (gimbap, 김밥) are good choices, I recommend trying some lovely chicken gizzard (dalkddongjip, 닭똥집), spicy rice cakes (tteokbokki, 떡볶이), or Korean style intestines filled with noodles (sundae, 순대). This is also a perfect spot to grab some more cheap beer and soju to keep the night running. Walk outside of Itaewon Station onto Itaewon Road (이태원로) from Exit 2. If you’re coming from a taxi, just get off near the station and you’ll see a few pojangmachas after midnight. Ever been to a luxurious food court? Well, here’s your chance. 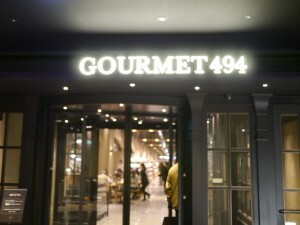 The Gourmet 494 food court is found in the basement of the high end department store, Galleria, in the richest neighborhood in Seoul, Cheomdangdong (청담동). We’re not talking Panda Express and Sbarro here (not that there’s anything wrong with either), but we’re talking about 23 of the trendiest, most elite, and popular restaurants and chefs who have a spot at Gourmet 494. Recently opened in October 2012, this is already a popular spot. Do you want sushi from Chef Matsumoto? Then check out Sushi Matsumoto. What about a phenomenal burger from Brooklyn Burger or perhaps a kalbi (Korean sweet short ribs) taco from the hottest Mexican restaurant in Seoul, Vatos? And we haven’t even mentioned Buzza Pizza, excellent artisanal, coal oven pizza, or the hot brunch restaurant Café Mama’s. I would highly recommend trying a smoothie or a Korean traditional dessert, patbingsoo (팥빙수) to finish off your meal. It’s a pretty simple process. Just pick your food of interest and you’ll be given a buzzer with a number on it. Place it on the radio frequency location on the table and 5-10 minutes later, voila, someone will deliver your food straight to you! Trust me, this is a good spot. Be sure to hover for seats. Try the bakery end for more seats. And after you’re done eating, why not do some window shopping for high end jewelry? Ed has previously lived in Korea and enjoys learning, thinking, traveling, and eating. I’ve been to the Kimchi Museum. It’s not actually very impressive, and it’s sponsored by a kimchi manufacturer, so it all kind of feels like a big brand promotion. i am gonna do all of these. korea in two weeks! Good! This article has lots of interesting points. I read it with great curiosity, because even though I’m a korean, there are something that I’ve never been to. :). What a well detailed article! Love these 10 things to do in Korea! Great article! I’ve only been to Korea once, but the next time I do, I’ll be sure to remember this cool article. visited DMZ via kooridoor and visited kimchi museum.I have awesome experience exploring seoul . Planning for Busan and Jeju this Oct for my birthday! I have never been to Korea and after reading this I really rally want to go… I already loved the night life of Seoul and want to try it out. I really wish if there will be a Korean restaurant in India too. 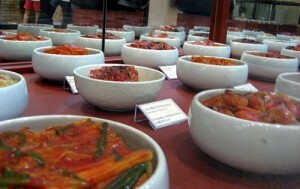 I really want to try Korean food m dying to taste it specially kimchi. You explain in detail about Korea before i do not have much information after reading this article i know ! All will do all this when I get there soon. Thanks. It is truly a nice and rich informative post. superb! what an awesome place I really want to go there. how old do you have to be to get into NB? what is the legal age? do they check your id? Thanks a lot for the impressive info. Is this North or south Korea?? ?